The waiting is over. Tickford Racing finally claimed its first Supercars victory of the season and the first win under new team’s name today in the first race of the Vodafone Gold Coast 600 event at the Surfers Paradise Street Circuit. Chaz Mostert and James Moffat won the 102-lap race in the #55 Ford Falcon, 9.5 seconds ahead of closest rivals. 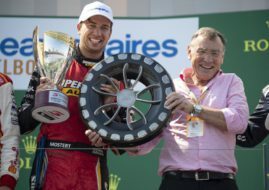 The last win for both Mostert and Tickford Racing came last year at the Gold Coast, while Moffat scored his only Supercars victory with Nissan at Winton in 2013. The podium was completed by Craig Lowndes/Steven Richards (Autobarn Lowndes Racing #888 Holden), who progressed from 21st on the grid, and James Courtney/Jack Perkins (Walkinshaw Andretti United #25 Holden). David Reynolds and Luke Youlden finished fourth in the #9 Erebus Motorsport Holden. The championship lead has been changed. Scott McLaughlin (DJR Team Penske #17 Ford) took over the lead after finishing fifth at Surfers Paradise, sharing a car with Alexandre Premat. The previous leader Shane van Gisbergen, who is sharing the #97 Triple Eight Red Bull Holden with Earl Bamber, finished in the tenth place today after starting from pole. The gap is now 14 points on McLaughlin’s side, with five more races on a schedule.